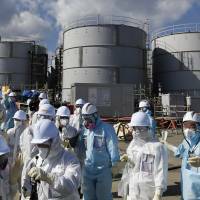 Coping with the vast amounts of groundwater flowing into the broken Fukushima No. 1 nuclear plant — which then becomes irradiated and seeps back out — has become such a problem that the country is building a ¥35 billion “ice wall” into the ground around it. Even if the frozen barrier built with taxpayers’ money works as envisioned, it will not completely block all water from reaching the damaged reactors because of gaps in the wall and rainfall, creating as much as 50 tons of tainted water each day, said Yuichi Okamura, a chief architect of the massive project. In an interview earlier this week Okamura said “it’s not zero,” referring to the amount of water reaching the reactors. He is a general manager at Tokyo Electric Power Co., which runs the facility hit by a triple core meltdown after swamped by tsunami in 2011, prompting 150,000 nearby residents to evacuate. Pipes that constantly spray water into the reactors keep the fuel from overheating, but coping with the resulting water has been a major headache. 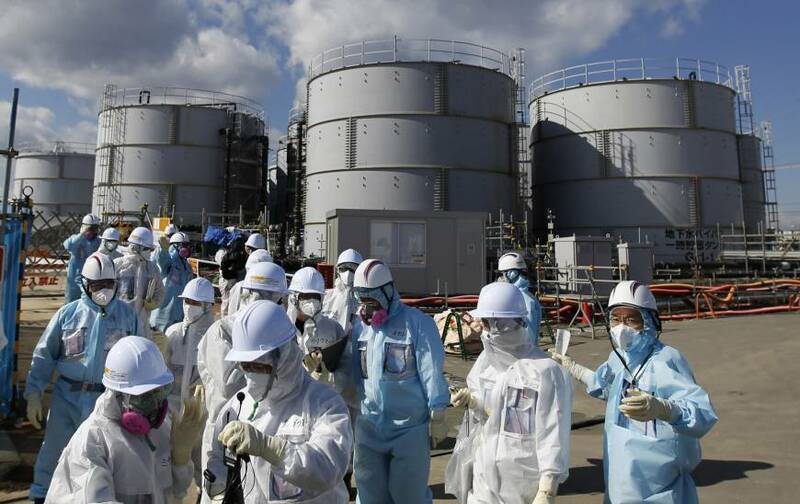 Tepco has stored the water in nearly 1,000 huge tanks around the plant, with more being built and added each week. Tepco resorted to devising the 1.5-km-long (1-mile-long) ice wall around the facility after it became clear it had to do something drastic to stem the flow of groundwater into the facility’s basement and keep contaminated water from flowing back out. The water woes are just part of the many obstacles involved in controlling and dismantling the Fukushima plant, a huge task that will take 40 years. No one has even seen the nuclear debris. Robots are being created to capture images of the debris. The radiation is so high no human being can do that job. The ice wall, built by construction company Kajima Corp., is being turned on in sections for tests, and the entire freezing process will take eight months since it was first switched on in late March. The entire wall requires as much electricity as would be needed to power 13,000 Japanese households. Edward Yarmak, president of Arctic Foundations, based in Anchorage, Alaska, which designs and installs ground freezing systems and made an ice wall for the Oak Ridge reactor site, says the solution should work at Fukushima. “The refrigeration system has just been turned on, and it takes time to form the wall. First, the soil freezes concentrically around the pipes and when the frozen cylinders are large enough, they coalesce and form a continuous wall. After time, the wall increases in thickness,” he said in an email. But critics say the problem of the groundwater reaching the reactors was a no-brainer that should have been projected. Building a concrete wall into the hill near the plant right after the disaster would have minimized the contaminated water problem considerably, says Shigeaki Tsunoyama, honorary professor and former president of University of Aizu in Fukushima. Even at the reduced amount of 50 tons a day, the contaminated water produced at Fukushima will equal what came out of Three Mile Island’s total in just eight months because of the prevalence of groundwater in Fukushima, he said. Although Tepco has set 2020 as the goal for ending the water problems, Tsunoyama believes that’s too optimistic. Okamura acknowledged the option to build a barrier in the higher elevation near the plant was considered in the early days after the disaster. But he defended his company’s actions. Opponents say the ice wall is a waste of taxpayers’ money and that it may not work. “From the perspective of regular people, we have serious questions about this piece of research that’s awarded a construction giant,” said Kanna Mitsuta, director of ecology group Friends of the Earth Japan.